There is a common misconception that it can be difficult to talk about yourself but if you are going to grow your business then this communication is vital. For those still concerned or unsure, read on. Digital PR is the means of getting exposure on the web but, much more than that, it is now part and parcel of traditional PR. There are few better ways to build your credibility and search visibility than through creating and distributing original, relevant and shareable content, which accrues quality links and creates a buzz around your brand. With a digital PR strategy, you’ll be looking to target not just relevant sites to spread your content, reaching a wider audience, driving traffic and hopefully gaining a link, but also appropriate influencers on blogs, online communities and social media networks, your target audience, prominent bloggers, the press, and more. Much like magazines and newspapers, where many have switched from print to digital, communications are also going online. There are several reasons for this and the benefits of crafting a digital space in which to communicate are vast. Digital PR is all about combining traditional PR with content marketing, social media and search: transforming static news into conversations and bypassing media to speak directly to your target audience online. News can be spread further, faster, and more directly to a specific target audience than ever before in history. It allows us to maximise news like never before. Instead of being satisfied with a single placement, your news can be shared exponentially. 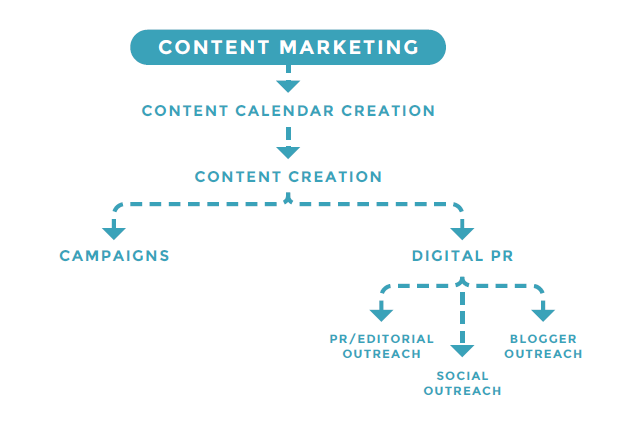 The below flowchart shows where digital PR sits in the chain and you can clearly see that it falls under the wider umbrella of content marketing. What is the difference between traditional and digital PR? Traditional PR covers crisis and reputation management, brand awareness and advocacy as well as brand messaging. Publicists will have a book of valuable contacts such as journalists, producers and influencers that they use to push content out. Traditional PRs tend to have a speciality niche, hence why they guard their contacts so closely. These contacts are typically built up over many years. It’s also key to point out that there are longer lead times for coverage to go live, especially with print publications. So unlike their digital counterparts, those using traditional methods are experts in patience. Digital PRs take into account their clients digital stipulations such as differing types of links, eg, affiliate or tracked, increased number of followers etc, and develop a digital strategy in order to achieve these KPIs using various channels. It is a much more holistic process, where every channel can potentially assist one another when it comes to these goals. Where it can get complicated is when you add the SEO element. Digital PRs have to consider Google webmaster guidelines, link quality, and roughly another 200 ranking factors, which can be quite a transition. How do you implement a good strategy and how can you create effective PR? Well the first thing you need to do is to understand your audience. Ask yourself about the type of content they are likely to engage with, where they find it and if it is good enough for them to convert or share. We call our process outreach and this is what, we feel, is the best way to make your information reach the right people at the right time. Once you understand what it is you want to say the next step is where. Outreach is the process of identifying the best possible outlets for your content and there are a number of tools you. Can use for this. According to The Drum, one of the best places to start is by searching Google News for your topic. This is a simple way of identifying publications and authors with an interest in your subject. Once you’ve identified a website that has recently published related content, do a site search to evaluate just how often they write on the topic and in what ways. This will also highlight other writers on the site to potentially contact and expand your network. We split digital PR into three clear sections and believe that this is the key to delivering the best results. By separating the content into PR/editorial outreach, social outreach and blogger outreach we can cover the entire market.